It has been a couple of months since my last Noona confession post so I figured I was about overdue for another “I am too old for this but…but…..I just want to put them in a basket and tie bows on them- and isn’t age just a silly number anyway? Right?! You feel me?” post. Oh, and I am going through major variety show withdrawals at the moment. Seriously. It is all hallucinating and shaking and craving and…okay, maybe not as serious as hallucinating but my laugh face is getting chubby without variety shows. So here it goes, Noona’s top 10 Exo Showtime moments in no particular order. Cheers! Because when Mom looks at you like that you cannot say no. Seriously, upon pain of death. Don’t send the maknaes to buy thoughtfu- wait, always send the maknaes shopping because it is entertaining as sh*t.
So how can you tell the members of Exo apart? Never fear, our Gramps leader is out to interview the members and figure out the best way to tell them apart. Enter Luhan and his assertion of manliness. (Scene ends at :36 in the video). 4- Aren’t you in charge of martial arts? Proof that once again Tao is a teenage girl. But I still love him. Because you can’t say no to Kyungsoo, or he will sacrifice your soul or something. Keeps the cash and gives a pic. Another reason I want to punch him and then give him a hug. Aish! Because there is so much stupid, adorable, and I love it. Under the sea, Baekhyun’s Grandma’s house, and galaxy indeed. Xiumin, that look killed me. Oh god how badly do I want to see more of Kris right now? Thanks for reminding me. I was starting to forget (heresy I know) how legit funny Showtime was! So how excited are you for the new show to start?? I was starting to forget how funny that show was too, then I re-watched some episodes 🙂 I am very excited for the new show to start! I think it is still delayed as of this week but when it comes out I will be searching for subs like a mad woman. Did you watch their First Box DVD? It was pretty entertaining as well. First Box DVD? NO! What’s that??! Am I in danger of losing my EXO fan credentials?? I’m been watching EXO-M’s performances in China, and not much else. Oh lordy! Thanks for the link. Kris and his books…that he can’t read *facepalm*. I will be way too intimately familiar with this soon, like, as soon as I get home. I just saw the Overdose video, and why the heck do they look like Backstreet Boys for half the MV?? And what did they do to Lulu’s hair?! But Tao though!! He’s looking all grown up! My thirst for him grows. Haha- Kris never fails to make me laugh. Did you watch the second part as well? Second that about them looking like the Backstreet Boys for half the MV- what in the what was their stylist thinking?! And the apple hair…yeah…not so much. Tao is looking all grown up. And Xiumin slayed in the MV (as did Suho). Looks like their new show is premiering tomorrow! Yikes- best carve out a couple hours to watch it (cause I can’t just go through it once or anything, nope). The cooking, and the foosball and the kiddie basketball? Gees, all that body contact *snerk*. And the Hong Kong tour etc. too. But it’s best when they’re eating and goofing off really. Xiumin! I know!! And Suho!! Yes!! What’s going on?! Is it the new hair colour? I never thought Suho could do blonde but something’s working for him. And Baozi stepping up!! Eeeee! I groaned when I heard Suho went blonde but it has really grown on me. Well, except for some of the times he looks like a 90s old school rapper- that is just comical. Xiumin blonde is working it, he became infinitely more attractive to me after the hair color change. The show does start tomorrow! Yay! Nothing is more awesome than EXO Showtime moments. Tao being a teenage girl is just my favourite thing in the world, it was things like that that made him jump up to no.1 in my M bias list. It was previously Lay, and geez he fights it out for Tao for that spot, I can tell you! When he was playing guitar with Chanyeol (who’s my no. 1 overall), I could happily have died and gone to heaven. The silent game is still my favourite moment in a Variety show ever. The fact that the Chinese boys just had absolutely no idea what was going on was hilarious. And the little bit of Luhan asking Xiumin what the game was and Xiumin waving his arms and trying to explain but not because they couldn’t actually talk, oh my god it killed me. Xiumin is the cutest thing in the world! I can’t wait for their next show! Tao being a teenage girl gives me life! Tao’s image keeps moving further away from the wushu bad-**s and more towards the mall rat, and I love him more for it. I can’t wait for their next show either. I saw somewhere in blog land that it would premiere this coming week – fingers crossed. 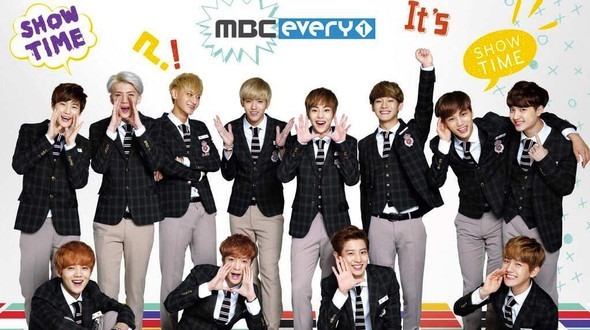 I miss EXO showtime. Their new show 90:2014 I guess is ok. I was hoping it would be like showtime with all the moments and gags. Still love seeing the boys though. I miss Showtime too! Their new show is okay, but it is not as enjoyable as Showtime, I agree. Here is hoping for a Showtime V2 soon!